Never forget you're something fierce with this expression of everyday empowerment. 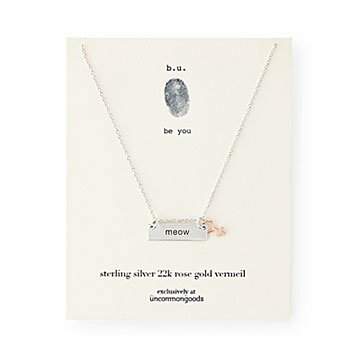 Never forget you're something fierce with this two-sided necklace that celebrates your inner voice. A petite silver bar is imprinted with "Meow" on one side and "Hear Me Roar" on the other for personal everyday empowerment, and the classic "female" symbol in 22-karat rose gold gives the piece subtle contrast and a little extra feminine mystique. Designed in Pennsylvania by Mary Steratore. Wax molds made in Italy, silver charms cast in Thailand, and assembled and hand-polished in the US. It was exactly what I wanted to for a 14 year old. It was dainty, not too fancy, can dress it up or down, had a lot of meaning behind it. I got this for my birthday, but lost it. I loved it so much that I purchased it again for myself! Tiny and delicate (you can't read it unless you are really close up) but the message is one of power, independence and strength. It can be dressed up or down. It matches my personality - feminine but strong. Love, love, love it! I sent these as gifts and the loved them! !